If you take your dog for his/her daily walk and carry two poop bags with you, your friend will poop three times and the third one will be done on the lawn of the only neighbour that is in their front yard. 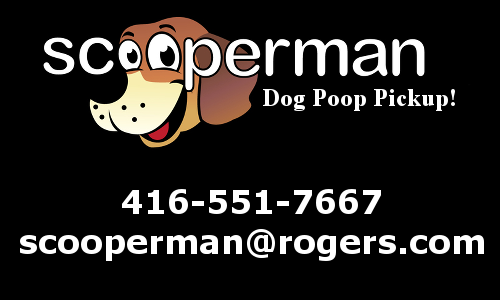 Scooperman Dog Poop Scoopers can’t be there for every time your dog does it’s business but we can be there every week to make sure your yard is clear of poop and ready for play. We love dogs and are looking forward to meeting yours. We should be there within a few days of your call (weather permitting) and we’ll get back to you within an hour of your contact even in the spring when everybody needs a poop pickup. Spring Cleans this year are averaging between $60 and $100 depending on the number of dogs you have and the length of time they’ve been using your yard since it was last cleaned. Give us a call and we’ll get it all.